[0:40] <irc_smirk> ZEROC001 you around? [1:19] <steve_rox> so it doesent catch power failure events? [1:22] <steve_rox> and what does not work? [1:26] <azizLIGHT> You think so? [1:51] <azizLIGHT> Have someone 3d print it? [2:33] <qrf> Ah, I suppose I could use the Pi as an SD writer by booting from a PC host somehow? [2:34] <qrf> You mean, it's the wrong cable? [2:41] <qrf> So is there an easy way to use a B+ as a micro SD writer without having a bootable SD card first? [2:44] <Sonny_Jim> I mean, do you have a printer that happens to have one? [2:51] <niston> hmm I realize clustering raspberries could be useful for failover scenarios in certain control applications? [2:52] <Caleo> is it just me or is the microsd in a bad spot on the B+? [2:54] <Caleo> why stick with a big card like SD when modern electronics demand small components? [2:54] <Caleo> I mean, have you held a SD card up to a Pi? [2:55] <Caleo> are your fingers dildos? [2:56] <Caleo> do you mean micro-sd or mini-sd? [2:58] <Sonny_Jim> Caleo: Are you? [3:01] <steve_rox> thats apple rubbish tho ent it? [3:05] <qrf> Does that one go in both ways, Caleo? [3:05] <qrf> Or does it have to face a particular side? [3:08] <steve_rox> did you win? [3:08] <steve_rox> now the camera project can continue eh? [3:11] <steve_rox> can you get long explosures? [3:13] <Bhaal> What client you using? [3:15] <steve_rox> how long can you set the exposure time? [3:16] <Bhaal> steve_rox: Ahuh ... did that camera cost you $35 ? [3:20] <steve_rox> how did it manage that? [3:20] <steve_rox> was it trying to make a call? [3:21] <steve_rox> the rpi ones? [3:24] <steve_rox> whats that do? [3:29] <steve_rox> would you place the rpi outside too with the cam? [3:39] <Bhaal> Caleo: Ahhhhh, ok... Sounds like a huge waste of aluminium to machine that kind of cylinder from a solid block as opposed to casting it..? [3:41] <irc_smirk> yo ZERO0C001 you there? [3:43] <Bhaal> Caleo: Hmmmm yeah, heatsinks with fans and then epoxy coat the rest of the thing? [4:15] <Bhaal> Caleo: Why not just keep it all in one of those fireproof boxes with a battery, record the journey and then retrieve the data afterwards? [4:39] <snuggyfoo> Is anyone willing to help me figure out how to allow motion to write to a NFS shared folder? [4:40] <snuggyfoo> Do I need LDAP auth? [5:46] <funkster> anyone know if there is any significant performance different in a7 dual 1ghz vs a9 dual 1ghz? [5:47] <funkster> bananapi vs udoo dual basically, need to step up my processing game a bit basically. [5:52] <strukturalna> you have a udoo? [5:54] <strukturalna> is it nice? [8:21] <SpicyShibe> Yeah I got mine when they were first released. One of the ones that has a hand soldered ethernet jack. [8:24] <Sonny_Jim> Isn't the RAM included on the SoC? [8:40] <gordonDrogon> you talking about the raspberrypi.org site? [8:59] <gordonDrogon> that's changing. the new curriculim is programming. [10:03] <gordonDrogon> Sonny_Jim, the wording is simply a text-based programming language. However most people are interpreting that as Python. [10:07] <gordonDrogon> I did program in Occam may years back - that's the only other significant whitespace critical language I've used. [10:07] <gordonDrogon> old FORTRAN was columnised too, but that was more to do with punch-card formatting than the language. [11:20] <niston> Occam? THe parallel thing? [11:20] <niston> when transputers where fly? [11:33] <elmargol> is mpeg2 decoding "untested"? [11:34] <gordonDrogon> niston, I did a lot of work with transputers - 20-25 years ago! [11:35] <gordonDrogon> didn't do much occam on them though - mostly C and a little bit of assembler. [11:35] <gordonDrogon> yup. I worked for a company next door, founded by folks who worked for inmos. [11:41] <shiftplusone> elmargol, far from it. Of course it's tested. [11:42] <shiftplusone> elmargol, bad power supplies, badly encoded files and issue with hdmi signal are things that can get in the way though. I'd start by trying to up the hdmi signal strength. [11:44] <gordonDrogon> it's a japanese word - means "excellence". Also has another meaning depending on how you pronounce it. best not to google for it. [11:45] <gordonDrogon> that's the one. [11:47] <gordonDrogon> so that big box could take 40 boards (codename M40) and each board could have had 4 transputers, each with 16MB of RAM each. [11:48] <gordonDrogon> then subsequent boards had 2 x i860's and 4 transputers with more memory, then they went to sparc based things. [11:48] <gordonDrogon> yes, the idea is good - not that scalable though. comms eventually becomes a bottleneck. [11:49] <niston> the serial links werent all that fast were they? [11:53] <gordonDrogon> think it was 10. max. cpu speed was 20Mhz. [11:54] <gordonDrogon> but this was 25 years ago. [12:00] <gordonDrogon> no MMU either, although I was part of a group that ported minix to the transputer at one point. [12:00] <gordonDrogon> we had a board with 8MB of RAM, Ethernet and SCSI. [12:04] <gordonDrogon> unlikely to have been minix. but there was something else. struggling to remember though. [12:15] <shiftplusone> Ah, now I see why you like to use Mono. [12:16] <shiftplusone> You're just nostalgic for the performance of devices in the old days. [12:16] <gordonDrogon> Who likes mono? [12:16] <shiftplusone> you'll LOVE python. [12:17] <shiftplusone> Hmm... wonder how mono compares to RTB when it comes to performance. [12:18] <gordonDrogon> mono compiles to some interpreted byte-code though? that might give it the edge. [12:19] <gordonDrogon> I have a plan to implement a sort of cache to store evaluations once though. one day. [12:19] <shiftplusone> I suppose it needs to load a few behemoth libraries for even the basic tasks. [12:19] <gordonDrogon> I did a hack of RTB to run as a cgi... it worked! [12:21] <niston> they were like "thats not running from the internet! thats local!" [12:22] * niston still thinks VB6 was heavily underrated by "experts"
[12:23] <shiftplusone> I guess the choice of language doesn't really matter if you're willing to look where the cpu cycles actually go and are willing to optimize it (with asm, if you must). [12:24] <shiftplusone> Tried gambas on the pi? [12:25] <niston> Some swiss dude invented that did you know? [12:26] <shiftplusone> All I know is that it was meant to be a programming language for teaching programming. [12:26] <shiftplusone> By some uni professor, iirc. [12:26] <gordonDrogon> I did loads of pascal once upon a time. [12:26] <gordonDrogon> I wrote a whole computer aided learning system in it for the Edinburgh hospital. [12:28] <niston> "Unable to bring back one of the Alto systems to Europe, Wirth decided to build a new system from scratch between 1978 and 1980"
[12:37] <shiftplusone> irgendwer4711, what display? [12:44] <irgendwer4711> n0vacane: do you have a heat sink? [12:45] <shiftplusone> and racing stripes to make it go faster? [12:47] <shiftplusone> If you're lucky, you can get a degree or two difference. But not only are they not effective, they're also not necessary. [12:48] <irgendwer4711> shiftplusone: you think design of chip is bad for heat sink? [12:48] <shiftplusone> No, the chip is designed to NOT need heatsinks. How many people put heatsinks on their phones? [12:50] <shiftplusone> n0vacane, you couldn't if you tried. [12:50] <shiftplusone> Unless you REALLY tried and knew what you were doing. You might need an oven, but the sd card would fail before the SoC was damaged. [12:51] <n0vacane> ok, sorry for not rtfm but do you know what temp it clocks down at? [12:51] <shiftplusone> definitely. Even 85 is nothing to panic about. [12:52] <shiftplusone> I'd be concerned and wondering why the hell it's that high, but I wouldn't fear that it would damage the pi. [12:54] <niston> 85 cus teh nsa is minin teh dogecoin on yu0r cpu! [14:09] <qrf> Do you think I could use an old Android phone of mine as a micro SD card writer? [14:10] <shiftplusone> Maybe, but you may as well splurge and buy a $1 reader. [14:28] <skyroveRR> rings to hold the wires] of different lengths, so which is the one where the grounding fits? The longest or the shortest? 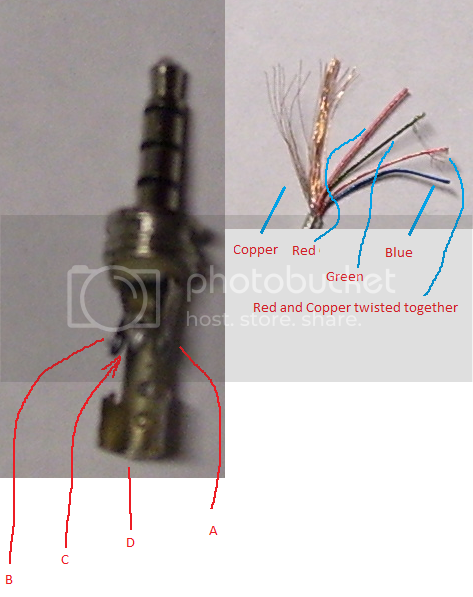 [14:32] <skyroveRR> I've got that exact same connector with the same rings. [14:32] <skyroveRR> So umm... if I'm guessing it right, the sleeve is the video and "Ring 2" mentioned in there is ground for real? Or is the pic a bit misleading? [14:35] <skyroveRR> KKlouzal: it's a TRRS connector. [14:35] <skyroveRR> pksato: that's for sure. I'm confused as to where's ground. [14:37] <skyroveRR> Sonny_Jim: http://i4.photobucket.com/albums/y136/invinciblegod/TRRSConnector3-1.png as in this one? [14:38] <skyroveRR> May you check the link I gave you? [14:38] <pksato> for B+, second ring is gnd, and sleeve is video. [14:39] <skyroveRR> No, it says the sleeve is mic. [14:39] <skyroveRR> And "Ring 2" is ground. [14:39] <skyroveRR> So, is that correct? [14:39] <Sonny_Jim> What are you trying to do? [14:40] <skyroveRR> To connect the wires of course. [14:40] <Sonny_Jim> To connect what to what? [14:40] <skyroveRR> Sonny_Jim: pi to TV. [14:41] <skyroveRR> Just wanted to know where gnd belongs, since my connector isn't shown on the link pksato gave. [14:45] <pksato> or confused on wires side? [14:48] <Sonny_Jim> So I kept on thinking "Nah, I must have it wrong because this is so obvious"
[14:48] <Sonny_Jim> "I mean, why would they ask if it wasn't 3?" [14:57] <skyroveRR> I got the TRRS connections ok, but I'm unable to get any display on the TV, I set the gpu_mem to 128, sdtv_mode to 2 and sdtv_aspect to 1, but still no output..
[15:03] <Sonny_Jim> Do you get the 'rainbow' square? [15:04] <Sonny_Jim> Do you have a multimeter? [15:04] <pksato> skyroveRR: you have access to rpi? use tvservice to check what output is on use. [15:05] <skyroveRR> Sonny_Jim: I have a multimeter, what should I do? [15:06] <gordonDrogon> Gadgetoid, looks interesting, I guess! [15:07] <skyroveRR> Sonny_Jim: I get a reading of 1102 and it varies. [15:07] <gordonDrogon> Gadgetoid, not something I'm a fan of though, however I guess it has its uses. [15:11] <pksato> on most multimeters, continuity/diode test beep if have continuity. [15:12] <Sonny_Jim> Why don't you just buy a cable? [15:13] <skyroveRR> Uh my composite video pinouts are doubtful... does the video go to the sleeve and the gnd go to the tip? [15:14] <pksato> on RCA end? no. video is the center pin. [15:14] <skyroveRR> Hence I wasn't getting an output! [15:15] <gordonDrogon> On the B+ the connector is left audio, right audio, Gnd then video is the outermost ring. [15:15] <gordonDrogon> the "tip" or innermost connector is left audio. [15:17] <skyroveRR> Thanks A LOT, GUYS, Thanks a LOT! [15:17] <pksato> On some TVs, if invtered wires, get b/w inverted video. [15:18] <skyroveRR> 9.5" I believe. [15:19] <skyroveRR> Can't believe I can see video on it. Unbelievable. [15:19] <skyroveRR> I am using slackware ARM, btw. [15:38] <Megaf_> now, what do I do!? [15:45] <Megaf_> shiftplusone: is it enabled on the netinstall image too? [16:23] <shiftplusone> eh? isn't it included? where did you get the source for it from? [16:26] <shiftplusone> and no, the file it wants is linux/arch/arm/mach-bcm2708/include/mach. You won't need to do anything special to specify it though. Just go through everything you've done so far. [16:28] <shiftplusone> You magically have a /root/spi-bcm2708 ? [16:29] <shiftplusone> Any particular reason you're not using the module already in the kernel? [16:30] <shiftplusone> K, I won't question it then. Sec, let me go over what you've got. [16:31] <shiftplusone> what does uname -a say? [16:32] <shiftplusone> it sounds like the .config there might be invalid. Could you pastebin it? [16:37] <Boscop> shiftplusone: what should i change? [16:37] <_inky_> All I get is "-bash: group: command not found"
[16:38] <shiftplusone> Boscop, looks fairly borked to me. [16:38] <Boscop> what should i do? [16:39] <shiftplusone> I haven't run into the issue you're having and would need to poke around there myself to track it down. For now, I'd just use the stock .config from the official kernel. [16:39] <Boscop> where is it? [16:40] <Boscop> shiftplusone: that outputs a config. so i should overwrite the old one? [16:43] <shiftplusone> Did you mess around with your apt sources? [16:44] <shiftplusone> did you try installing a .deb file for another platform or something? [16:44] <shiftplusone> The short version is that you've done something and I think only you know what that is. [16:44] <Boscop> how can i fix it? [16:46] <Boscop> shiftplusone: maybe the sd card is damaged? [17:01] <Boscop> how long does the check usually need? [17:02] <shiftplusone> depends on the card speed and size, I guess. [17:02] <Boscop> shiftplusone: 4gb, class 4 ? [17:06] <Boscop> shiftplusone: how long would i take? [17:06] <shiftplusone> Haven't timed, Boscop. [17:07] <Boscop> Hello71: which LED? [17:59] <Gadgetoid> i2c-0 go byebye? [18:01] <shiftplusone> Gadgetoid, there's an override to re-enable it. [18:04] <Gadgetoid> Damn you, DAAAMN YOUUU!!! [18:05] <Gadgetoid> Since trawling git didn't help! [18:48] <Boscop> how can i recover files from the pi when it's not booting anymore? [18:50] <KKlouzal> what are the individual little chips on sticks of ram called? [18:50] <skyroveRR> Boscop: if you have a linux operating system, you can mount the partitions to directories and then recover the data from there. [18:52] <ShorTie> atleast a couple of meters i would think, how long of a cable do you need ? [18:52] <skyroveRR> About 3 meters..
[18:52] <skyroveRR> Will it affect the quality? [19:13] <skyroveRR> ShorTie: successfully made the cable. :) A more "permanent cable". [19:47] <ESphynx> hey guys... so should I plug keyboard/mouse on a hub or can I plug these directly on the Pi? [19:48] <ESphynx> So just for things like a HD or something? [19:49] <shiftplusone> b or b+? [19:50] <kilbith> hi there, I'm new on Raspbian, all is great but I'm wondering if it's possible to change the keys on Minecraft-Pi ? [20:56] <RahulK123> Can someone help me with a problem? Im new to Pi I have no monitor so I only have a macbook pro with a terminal. [20:57] <shiftplusone> what's on the sd card? [20:58] <shiftplusone> So, nothing. Noobs is an installer/recovery system. Not a full OS. [21:00] <RahulK123> @siftplusone, so you're sure it has no OS on? [21:00] <RahulK123> Kingston Micro SD Card pre-loaded with "NOOB" (Includes Raspbian -- OpenELEC -- Arch -- RaspBMC-- RISC OS -- Pidora) is what the product said anyways. [21:01] <RahulK123> Can I get all this done without a monitor or microsd slot in my laptop? [21:01] <shiftplusone> as I said, NOOBS is an installer for all of the operating systems you've listed. They're not pre-installed, they're just available for install. [21:02] <RahulK123> Can you guide me through it? [21:02] <RahulK123> But setup is a faff. [21:03] <Boscop> shiftplusone: and where is linux/arch/arm/mach-bcm2708/include/mach ? [21:03] <RahulK123> shift, that seems advance for me. [21:04] <RahulK123> siftpulsone got skype? [21:04] <RahulK123> I can just share screen :D? [21:04] <RahulK123> Would really help me out a lot! [21:04] <shiftplusone> RahulK123, sorry, not up for that. [21:04] <RahulK123> Alright, no worries. [21:04] <shiftplusone> do you have a card reader or not? [21:06] <Boscop> so how to tell spi-bcm2708 where the git repo is? [21:07] <r3dsm0k3> Hey all, first timer here. I think Im facing the USB packet loss issue while connecting a web cam and the video becomes too patchy. any pointers here? [21:08] <shiftplusone> it doesn't care about any git repo. You just need 3 things: linux kernel source, the spi module source and a cross-compiling toolchain. [21:08] <Boscop> shiftplusone: which toolchain? [21:11] <r3dsm0k3> or is there an experimental firmware or something I could try? [21:18] <taza> r3dsm0k3: Are you using a powered usb hub? [21:29] <shiftplusone> r3dsm0k3, not firmware, but you can play with the fiq masks. [21:30] <r3dsm0k3> Thats such a bummer for me, I use Logitech C920 camera with h264 support. [21:31] <Boscop> shiftplusone: i have to build it? [21:32] <Boscop> which one should i use of those 4? [21:37] <shiftplusone> Nothing, it's a bit on the advanced side. I'd just chalk up the camera as not working and try a different approach. Only the guy who wrote the USB driver knows all the runes to try. [21:38] <ESphynx> hey so by default... my home directory, is it on my microsd card? [21:39] <Boscop> shiftplusone: how do i tell make to use that one? [21:46] <shiftplusone> was afk, making tea. [21:46] <shiftplusone> Boscop, what have you got so far... do you have 3 directories: linux, tools and bcm2708-spi (or whatever it's called)? [22:05] <Boscop> without any environment variables? [22:05] <Encrypt> Do you know espow.com? [22:08] <Boscop> should i undo some config? [22:08] <Boscop> so i have to reflash it again after it finished? [22:09] <shiftplusone> this is just to make sure your env is set up for compiling the module. I think you already know what to do there. [22:09] <Boscop> but why do i have to compile the kernel if i just need the module? [22:12] <steve_rox> anything fun going on? [22:12] <shiftplusone> I'm drinking tea... that's fun, right? [22:13] <Boscop> shiftplusone: thanks. it built: http://pastebin.com/Csv6aS7s now where do i put which files on the pi? [22:15] <shiftplusone> what's in there? [22:16] <Boscop> just the .ko file? [22:17] <shiftplusone> but I don't know if it will auto-load. I haven't gotten that far myself. I only compile and insmod. [22:18] <Boscop> should i create a subfolder for it? [22:18] <Boscop> ok, i moved it there, now just reboot? [22:20] <HoloPed> Hi all, is there a CS-mount version of the PI camera ? Or an adapter ? [22:21] <shiftplusone> Boscop, try rpi-update to make sure the kernel is the same version then reboot. [22:31] <Boscop> shiftplusone: i rebooted. the spi module doesn't show up in lsmod. so it's not auto loaded? [22:39] <Werel> I have my pi running headless with auth key login. I made a seperate account I want to give access soley for sfpt purposes... is there an easy way ( a passwd or similar command with argument ) I can remove this new account's password, so the only way to log in is using the auth key? [22:39] <shiftplusone> Boscop, does modprobe spi-bcm2708 work? [22:40] <Werel> I created the account with the --disable-password flag, but then after changing settings, I gave it a password on purpose, now I'm trying to remove it. [22:40] <shiftplusone> and does it show up in lsmod afterwards? [22:41] <Boscop> how to get it to auto load? [22:41] <Werel> Jusii, with just an asterisk? [22:41] <Boscop> shiftplusone: isn't there a way to list the path too? [22:41] <Boscop> shiftplusone: where is the builtin one? [22:42] <Werel> Jusii, just curious, what's the ! I see for some other entries? [22:45] <Boscop> shiftplusone: if i move the ko file to another place and try to load the module, can i infer from the result if it had loaded my version now? [22:45] <shiftplusone> well... if you move the stock one, yeah, I guess. [22:46] <Boscop> but won't they have different size? [22:46] <shiftplusone> but this is venturing outside of what I have experience with. [22:46] <shiftplusone> yeah, you'd think so. [22:47] <Boscop> shiftplusone: hm, same lsmod result. how can i figure out which version was loaded? [22:48] <RahulK123> Why is this happening? [22:49] <RahulK123> I've spent all day to try and set up my new pi. [22:49] <RahulK123> I don't have a HDMI compatible monitor. [22:50] <HoloPed> Can the PI drive two camera boards ? [22:50] <HoloPed> what would the be the capture rate, from two cameras, at 5mp ? [22:50] <HoloPed> max capture rate ? [22:51] <RahulK123> 5 is just the 5)th listed. [22:51] <RahulK123> So how is this wrong IP? [22:54] <steve_rox> what you trying to aceess on it? [22:54] <RahulK123> I havent got a monitor. [22:54] <RahulK123> So I want to SSH to set it up. [22:55] <RahulK123> I got it with NOOBS preinstalled. [22:55] <RahulK123> Im on a mac. [22:56] <RahulK123> I followed this guide: http://raspberrypi.stackexchange.com/a/19928 the Pre-Install how to part. [22:56] <RahulK123> Im on a macbook. [22:57] <RahulK123> Steve, that's what i'm trying to do. [22:57] <RahulK123> I can't get on the Pi..
[22:57] <steve_rox> it boots dont it? [22:57] <Werel> steve_rox, I've found that when I try to run raspi-config through terminal, I can get to the blue screen where I can select my options, but after I select an option, it just hangs on a blank screen for a couple moments then dumps me back into shell. [22:57] <RahulK123> Are you talking to me :D? [22:58] <RahulK123> I get ssh: connect to host 192.168.0.13 port 22: Connection refused. [22:58] <RahulK123> So what do I need to do to fix this? [22:58] <RahulK123> I can't get a monitor. [22:58] <RahulK123> Don't have one. [22:59] <Werel> try just telnet, first, don't specify a port, just your raspi machine. it's open with telnet by defaut, isn't it? [22:59] <RahulK123> Can my macbook word a display? [23:01] <RahulK123> Ok, I'll have to pop to the shop tomorrow for an adaptor. [23:02] <RahulK123> Btw, a quick question; am I supposed to touch the board? [23:02] <steve_rox> the rpi board itself? [23:02] <RahulK123> I got a case with it, and it wouldn't fit right. [23:02] <Werel> also, you sure your local network is on 192.168.0. * and not something like 192.168.1.* ? [23:02] <RahulK123> I was forcing it in, still not gone in. [23:03] <RahulK123> Help with that? [23:03] <Werel> steve_rox, I don't think ssh is either, but I think basic telnet IS. [23:03] <RahulK123> telnet didn't work before..
[23:04] <RahulK123> I don't know the commands though? [23:05] <Werel> it depends on how it starts up, I remembered when I got mine and I bought the preloaded SD card, it prompted me first what type of OS I wanted, raspbian, xmbc, etc. [23:05] <RahulK123> Steve, do you have Skype? [23:05] <Werel> do you have a tv set ( any kind with the yellow red white jacks in it ) and a dvd player? [23:05] <RahulK123> Maybe tomorrow I get the adaptor and I have troubles. [23:05] <Werel> or, a dvd player at all? [23:06] <Werel> in the back of the dvd player, is it connected with a yellow red white, or hdmi plug? [23:06] <RahulK123> I have a red, white red, on my tv. [23:06] <RahulK123> Not sure what they all connect to. [23:06] <Werel> if it's hdmi, there's your visial interface. if it's the yellow round jack, there's your visual cable. [23:07] <RahulK123> I have a yellow thing. [23:07] <RahulK123> I'll take a look thanks. [23:07] <Werel> and it should work! [23:08] <Werel> I've never used the composite jack, myself, but I've got to assume it works. [23:09] <Werel> I got a hold of a 25ft hdmi cable, I can plug my laptop into from where I sit across the room, or ther other day, my pi :P So convient, and does sound, too. [23:09] <Werel> What's the word? [23:10] <RahulK123> The three colours connected to the back of the PS3..
[23:10] <RahulK123> They were all in one plug type of thing. [23:10] <RahulK123> I have a DVD player, with no wires also. [23:10] <Werel> dvd player but no way to use it? [23:10] <RahulK123> I got power. [23:12] <RahulK123> Ok im off, thanks anyways guys. [23:12] <Werel> Well get an hdmi or something and good luck! [23:12] <RahulK123> I'll have to go to the market tomorrow. [23:13] <RahulK123> I'll add you tomorrow. [23:13] <RahulK123> I got VGA. [23:13] <RahulK123> Just not the HDMI to VGA adaptor. [23:13] <Werel> I find messing with adapters is confusing, but if it works. [23:14] <RahulK123> It's a B+. [23:16] <Werel> steve_rox, oh yeah? [23:16] <Werel> nonstandard HDMI, like, the mini one? [23:25] <Werel> super caps, like, the new supercapacitor things? [23:26] <Werel> have you seen that capacitor bank by that hackerspace group? Project Thumper? [23:27] <Werel> I can believe it. [23:27] <Werel> so I'm trying to mirror my /var/www folder into my /home/ftpsecure directory... I'm gonna try to use this export and mount command I read about when trying to set up a remote filesystem between two computers, but only do the local part, and see if I can just do it there. [23:30] <HoloPed> Can the PI drive two camera boards ? [23:34] <HoloPed> but the plan is to allow two cameras, on the compute module ? [23:35] <HoloPed> Do you know of any other board level computer that can drive two cameras ? [23:35] <shiftplusone> yes, the compute module can have two cameras and can do stereoscopic magic. [23:37] <HoloPed> but I would need to make my own board ? [23:38] <shiftplusone> so yeah, not entirely practical for hobbyists right now. [23:39] <HoloPed> the new module is only available in devkit form ? [23:39] <steve_rox> is it possible to run more than one prog in one terminal session and have its output on screen? [23:41] <shiftplusone> they're supposed to be available without the dev kit this month, but without the dev kit, they're a paper weight, unless you know exactly what you're doing. [23:41] <plugwash> farnell now seem to have the compute module listed as "awaiting delivery"
[23:42] <plugwash> HoloPed, there are different levels of "hard"
[23:42] <shiftplusone> HoloPed, for industry customers who can afford to hire an engineer to make a daughter board for them. [23:42] <HoloPed> Another question, is there a CS-mount adapter for the camera ? [23:46] <shiftplusone> and I obviously meant to say motherboard, sorry.